Nebraska natives, The Wildwoods, a five piece band from Lincoln, NE, bring a pioneering sound to Americana Roots Music. Formed in 2012, The Wildwoods released their first album, "A Little Sweeter" in 2014 and have since released two more albums independently: "Take A Chance" (2016) and "Sweet Nostalgia" (2017). 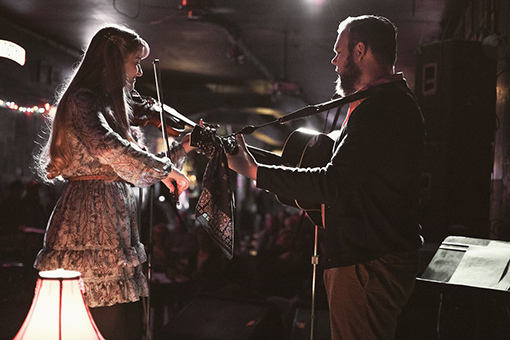 The two lead vocalists of the group, Noah and Chloe Gose, also released a Duo EP titled "Birdie and Goose" in late 2017. Following the successful release of their album "Sweet Nostalgia" the Wildwoods have opened for touring bands such as Elephant Revival, The Von Trapps, and Jamie Wyatt. They continue to tour regionally throughout the Midwest and Mountain States. The group was nominated in 2016, 2017 & 2018 by the Omaha Arts and Entertainment Awards as one of the top Americana Folk Bands in the area, and in 2017 as Local Album of the year for their album "Sweet Nostalgia" In December 2017, they performed live as part of the Paste Music & Daytrotter Sessions. The Wildwoods strive to make music that touches the soul & speaks of truth, that will be sure to melt your heart after every performance.